Suidooster Teasers April 2019 – Upcoming Telemundo drama series ‘ Suidooster’ teasers, previews, updates, episodes, highlights and spoilers for April 2019. 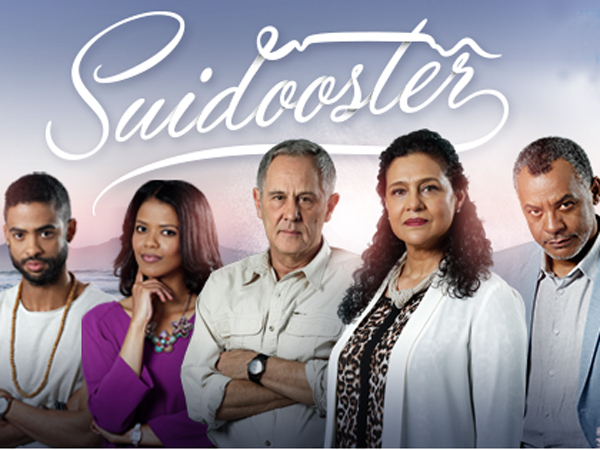 Suidooster airs on kykNET and kykNET & Kie Mondays to Fridays at 18h30. Danielle returns to work, while Justin and Siya try to sort out their love triangle with Chelsea-Kate. Kaashifa’s popularity is growing on Mymoena’s cooking channel. The tension is palpable between Izette and Danielle in the office, and Carmen makes a plan. Chelsea-Kate feels bad about the conflict between Siya and Justin, while Kaashifa makes a big change. Siya and Justin struggle to stick to their agreement, while Bianca and Mymoena argue about Kaashifa. Izette sees an opportunity to outwit her “business partner”. Bianca is still concerned about Kaashifa and Mymoena’s relationship but everyone thinks she is overreacting. Izette and Tim are forced to go and see a client together, and Justin accidentally sends Chelsea-Kate a love letter. Everyone is trying to solve the mystery of Izette, and Chris makes a shocking discovery. Mymoena’s latest video upsets her and leads to an interesting turn. Chris makes a breakthrough in his investigation on Izette’s disappearance. Mymoena gives Kaashifa a second chance, while Tim realises the full extent of Izette’s betrayal. Kaashifa does something she immediately regrets and Mymoena is faced with a difficult choice. The investigation into Izette’s activities takes an unexpected turn. Danielle’s life is turned upside down, while Mymoena has to make a decision regarding her and Kaashifa’s future. Tyron and Wade get embroiled in their friends’ love lives. Danielle struggles to keep her head above water while Mymoena’s children take her on about Kaashifa. Siya and Justin have coinciding relationship troubles and realise something’s not right. Justin questions his friendship with Tyron, Wade and Siya. Mymoena’s public demo takes place, while Tim and Danni’s relationship is tested yet again. Danielle reaches breaking point and everyone tries to help, but it seems in vain. Siya and Justin compete openly, while Bianca has a big surprise for her mom and Kaashifa. An online article about Mymoena’s show wreaks havoc, while Tyron is scheming. The Ruiterbosch community deals with the shocking news. Zoe starts blaming herself, while Simon has his own ideas about what happened. Meanwhile Mymoena tries to get out of her contract with Kaashifa. The people of Ruiterbosch are in mourning. Mymoena and Kaashifa are equally stubborn, while Siya gets a pleasant surprise. Mymoena struggles to accept her new agreement with Kaashifa, while Justin fears that Chelsea-Kate is starting to prefer Siya. Zoe lays into Tim. Mymoena and Kaashifa want to act professionally in front of the camera, but it’s easier said than done. Tyron gives Siya a valuable tip about Chelsea-Kate, and Tim says the wrong thing at the wrong time. Ian decides to take further steps to keep someone safe but Tim is unhappy about it. Siya steals Chelsea-Kate away from Justin, and Mymoena is upset about her argument with Kaashifa. Tim’s plans are starting to go awry, while Mymoena bravely tries to fill a gap. Tyron plays referee between the two suitors. The two suitors are waiting for news of Chelsea-Kate’s decision. Ian has a plan for Malerbe. Mymoena learns more about Kaashifa’s video. Justin feels his life is going nowhere, fast. Shocking news elicits various reactions from the people of Ruiterbosch, while Mymoena is presented with an opportunity and a difficult choice. Kaashifa pleads with Mymoena to be a part of Hallie-happies again. Justin decides to concentrate on his music career. Justin believes he has made a breakthrough in his music career, and Ian is caught off guard when he runs into someone from his distant past. Tim makes peace with the new developments in his life. Justin wonders if he should try his hand at modelling and Mymoena organises a dinner party for Kaashifa. Rhafiek feels increasingly frustrated with his circumstances, while Justin needs to go for a photo session before he can get modelling work. Lee-Ann is sceptical about Ian and Sharon’s relationship and sets a trap for them. Rhafiek is frustrated and irritates Carmen. Justin gets into trouble with Bridgette, and Sharon is annoying people. Mrs J’s kindness knows no bounds, and everybody likes Justin’s photo’s but he only sees his flaws. Sharon gives Ian a piece of her mind. Sharon is in a tight spot and causes a stir. Rhafiek tackles a new adventure, but it’s much tougher than anticipated. Justin is in trouble at Oos Wes. Sharon annoys Lee-Ann and Bridgette smells a rat. Rhafiek sets his eyes on his future and Justin is unsure about his future as a model. The young Samsodiens wrestle with what to tell their parents about the gambling money. Justin’s photo shoot turns out differently from what he expected and Sharon gets a job interview. Lee-Ann is still suspicious about Sharon. AB puts his foot down about the gambling money and Justin is adamant to make a success of his new career. Sharon considers leaving Ruiterbosch for good, while Rhafiek is facing a very difficult decision. Justin has to do something about his appearance urgently. An unexpected twist gets in the way of Carmen and Rhafiek’s dream. Justin’s new career starts on a high note, while Chris and Ian realise that Sharon might be more dangerous than she looks. Ian suspects Sharon knows something about some of the skeletons in his closet. AB and Rhafiek argue about the haram money, while Justin is on the warpath over his photo shoot. Sharon makes demands, and Ian tries to save the day. Mymoena attempts to broker peace, while Justin’s modelling dreams are in ruins. Justin deals with a disappointment, while Mymoena is torn between her loyalty to her husband and son. Chris tries to convince Ian to give Sharon what she demands from him. Bridgette wants to make the most of their time in New York and Ian is happy to pay. Lee-Ann’s suspicions about Sharon deepen, while Zoe is excited to welcome Wade back. Rhafiek takes his first tour group on an eventful hiking trip, while Bridgette is on the warpath and Ian need to duck. Justin suffers a setback. Bridgette believes her marriage is in good standing, but Lee-Ann is not convinced. Blaise suggests a shocking solution to Justin’s injury problem, while AB turns his back on Rhafiek. Rhafiek races to get his new business ready for the grand opening, while Justin is led into temptation. Ian is desperate for another way to keep Sharon at bay. Mrs J gets hot under the collar when Bridgette gives an opinion on family matters. Justin misunderstands Danielle’s intentions and Sharon confronts Ian. Bridgette’s strange behaviour sets off warning bells for her family. AB wants to soften towards Rhafiek, but then the last straw breaks the camel’s back. Sharon’s desperation makes her dangerous and she wreaks havoc. Bridgette tries to get behind the truth of a family secret but someone won’t make it easy for her. The boys want to support Justin, while Mymoena tries to mend AB and Rhafiek’s shaky relationship. Mymoena can’t do what AB expects of her. Mrs J struggles to face the truth, while Mymoena is fed up with the feud between AB and Rhafiek. Justin’s temper begins to surface. The Octobers and Jacobs family is facing a crisis, while Justin gets a new modelling opportunity. It’s AB’s birthday, and Mymoena tries to convince him to invite Rhafiek over. Rhafiek’s business experiences a big setback, while Justin is unhappy about his looks. Everyone is still reeling from Sharon’s revelation. Bridgette takes a firm stand, shocking everyone close to her. Justin receives his modelling photos. AB and Mymoena try to support Rhafiek but things turn out badly. Lee-Ann licks her wounds and Michelle discovers something about the diving master. Justin misreads the signals again.